In a BBC News Magazine article published several months ago, Matthew Engel discusses and laments Americanisms. 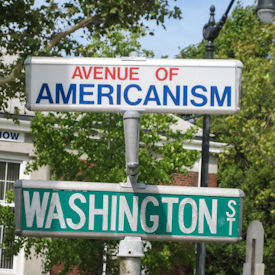 The article, “Viewpoint: Why Do Some Americanisms Irritate People?,” explores the increasing presence of Americanisms in the British vernacular, and how some Americanisms should be a cause for alarm. As an American, I found Engel’s opinions humorous and a bit trite, but I’d like to offer a brief commentary. Have any Beyond Words‘ readers outside of the United States experienced any hostility toward American English usage? Is this a global (maybe even globish) phenomenon, or is it simply the complaint of a small minority in the UK? Let us know your thoughts! Thank you so much for an interesting and inspiring blog. I like American English more than British English. Loved the post and found it very funny. I don’t understand, though, the irriation with the differences in some of our terms. Many of the Brits’ terms make me laugh and I’m sure many of them feel the same way about ours. It makes me want to visit Great Britain and just enjoy taking in our differences and commonalities.